About the Artist: Little is known of Thomas Langdon's origins, but he is believed to be the same Thomas Langdon who entered the Royal Academy schools at the age of 14, in 1783. 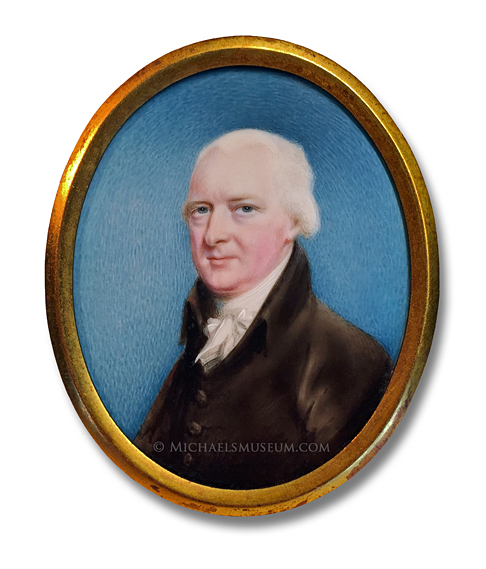 Between 1785 and 1802, he exhibited 37 portraits at the Royal Academy of Arts, exhibiting from 19 Vere Street (1785-1786), 38 Great Portland Street (1787), 8 Titchfield Street (1795), 20 Mortimer Street (1796-1797), 12 Tottenham Court Road (1800), 38 Margaret Street (1801), and 43 Charlotte Street (1802). From 1809, he relocated to Bath, Somerset (where it is supposed he may have originated before arriving to London). He appeared in Bath city directories from 1809 to 1824, listed as a miniature painter residing first at 10 Argyle Buildings, and then 37 Milsom Street. Also listed at the same addresses was his wife (only identified as "Mrs. Langdon") who was a teacher of poonah painting, painting on glass and velvet, and modeling in wax. Thomas Langdon died in Bath in June 1826. Listed by Benezit, Blättel (pages 556, 557) and Foskett (page 584).